Discussion about Sola Scriptura at a Muslim blog. Muslims are using Roman Catholic arguments to cast doubt on the doctrine of Sola Scriptura and the basis for the canon. They then use the arguments against Sola Scriptura and the Canon to cast doubt on reliability of the NT books themselves. I noticed this a long time ago in evangelism with Muslims. And then when I started listening to Dr. White's debates and reading his books, and visiting regularly his web-site sometime in 1996- 2004, (when it had these articles on Roman Catholicism), I noticed it even more in the details of Roman Catholic agruments and how Muslims would bring up the same objections as regards the canon and Sola Scriptura and church history details. I remember when Dr. White started sharing why he was going into debating Muslims - because a lot of the apologetic issues are the same on the history of the text of the Bible, textual variants, inerrancy, the canon, Sola Scriptura, church history, etc. His experience with Roman Catholics, King James Only advocates, Mormons, atheists, and others had prepared him for defending the faith against Muslims. Dealing with Mormons, Jehovah's Witnesses and Oneness Pentecostals prepared him for dealing with Muslim objections to the Trinity. Jonathan Doyle is a Roman Catholic. If I recall correctly, he is a traditionalist Roman Catholic, one who holds to the Tridentide Latin Mass as binding, sees the "no salvation outside of the church" as binding and Vatican 2 was wrong to soften that tradition, and probably disagrees with a lot of Vatican 2 and the modern Popes since that time. But he has not shared the exact details of his views on those issues. For once I fully agree. From the Catholic point of view, the Christian religion existed before the Gospels even started to be written, so it is absurd to claim one is based on the other. the Catholic position is certainly more historically accurate and plausible than the evangelical. Sola Scriptura never says that the Christian religion did not exist from 30 AD to 48 AD or did not exist until 96 AD, the common date for believing all the NT books were written by that date. Most were written before 70 AD. 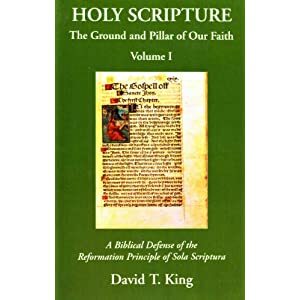 Protestants who hold to Sola Scriptura agree that the church existed in that period of 30-96 AD, while the Scriptures were being written; and oral preaching and teaching (God-breathed tradition) of the gospel was authoritative – 2 Thess. 2:15. Ken who decided which books were to go into the Bible? And by what authority to do reject the Bible commonly accepted by the early church? Who elected you a Protestant Pope or are you self-appointed? The anti-thesis principle against the thesis principle of Sola Scriptura is the claim of the Roman Catholic Church is that the Pope is infallible, and that was not proclaimed as dogma until 1870. This is very late in history, and totally absent from the early centuries of church history. The RC claim is also that only it as a church is infallible and infectible – before the dogma was proclaimed in 1870, the church and bishops and councils, etc. were infallible in doctrinal decisions and interpretations. Sola Scriptura is only saying that only the Bible is infallible; the Pope and the church are not infallible; and there are many different definitions of what “tradition” is. Some traditions are derived from Scripture and good; others are not. Protestants believe in church and church authority to teach and interpet the Scriptures properly. (Ephesians 4:11-12; 1 Timothy 3:14-16; 2 Timothy 4:1-7; 2 Tim. 2:2) It is the Roman Church that claims only it has the right and authority to interpret the Scriptures and that it is always infallible in her interpretations and decisions. When that Roman Church started adding other doctrines to “the faith” and claimed that they were from the apostles, like penance instead of repentance, purgatory, indulgences, NT priests, ex opere operato priestly powers, Transubstantiation, the treasury of merit, good works as meriting salvation, prayers to dead saints, relics, icons, statues and people praying to those inanimate objects, exalting Mary too much in prayer and praise – those things eclipsed the teaching of justification by faith alone, especially in Romans and Galatians and the gospel of John and is totally consistent with James 2; – when the RC Church was more exposed for making mistakes and adding doctrines not found in the Scriptures(Wycliffe, Hus, Luther, Calvin, etc), the fall-back position was Sola Scriptura, that Luther relied on, in order to back up authority for protesting against the false doctrines that the RCC had been slowly adding through the centuries. In fact there was no such thing as a Papal office in the early church. Even Gregory in 601 AD, the bishop of Rome, rebuked John of Constantinople for claiming he was “Universal Bishop”. Cyprian (lived 200-258 AD), bishop of Carthage, in 258 AD, along with 86 other bishops from around the Christian world, rebuked Stephen, bishop of Rome, for claiming that he was “bishop over all the other bishops”. See here for the 7th Council of Carthage, where Cyprian, Firmillian, and 85 other bishops condemn Stephen, the bishop of Rome, for his arrogant claims. What is the scriptural evidence for this claim? The principle of Sola Scriptura is not explicit in one verse, but the principle is derived theologically from bringing many texts together in a harmonized and consistent way. 2 Timothy 3:16 – since all Scripture is God-breathed, then it is infallible. Jesus said to test traditions by the word of God, the Scriptures – Matthew 15:1-20, Mark 7:1-23. The “only” is implied from these passages, because the only other atlernatiive is man and his interpretations, and additions to Scripture; therefore only the Scriptures are infallible, not man. Therefore the Pope and councils and other traditions are not infallible, since they are man made. The early E. creeds (Nicea, Constantinople, Apostles, Athanasian) and 4 ecumenical councils were right because the doctrinal decisions were based on Scripture, not tradition. They are secondary sources of authority, along with local church elders/teachers/pastors/overseers, but they are not infallible. John 17:17 – Jesus said to the Father – “Thy Word if truth”. John 17:8 – the words from the Father to Jesus, then to the apostles and later the Spirit would bring all things to their remembrance and lead them into all the truth – John chapters 14, 16. Psalm 119 – 176 verses on the truthfulness of God’s Word. God spoke through prophets and apostles. the Prophets and apostles wrote the Word of God down in Scriptures. So, the Scripture are also infallible. When traditions are tested and questioned, the Scriptures overrule them; therefore only the Scriptures are infallible, since man is not infallible and his interpretations and traditions therefore are not infallible. Traditions (oral teaching and preaching during the process of the time of en-Scripturation – 30-96 AD) of the apostles (2 Thess. 2:15; 3:6; I Cor. 11:2, 1 Cor. 15:1-9; Jude 3; Galatians 1:6-9) are infallible because the Scriptures say that they are. (in those contexts – also 1 Thessalonians 2:13 – the preaching of the gospel / word of God was accepted not as the word of men, but as the word of God. The unbiblical traditions of the Roman Catholic Church were man-made traditions not in Scripture at all, not even implicitly. The doctrines like the Trinity are Scriptural because they correctly derive from Scripture, in a consistent and harmonized way. I don’t agree that “only” is implied at all anywhere in the Bible – its a very weak argument Ken. And it was not believed by Christians till the likes of Luther came along. The bizarre thing is that the Bible does not even claim to be the Word of God so why should it be the only authority! Does the Bible ever say that the elders/teachers/pastors that the apostles appointed to lead the churches would ever be infallible? Therefore since we know God and His Word are infallible and man is not infallible, then by logic, only God’s Word is infallible as oppossed to man’s interpretations of the Scriptures. Therefore, the “only” in “Scripture Alone is the final and infallible rule of faith and practice for the church” is implied. They did not “decide” but they discerned and testified which ones were God-breathed and already existed, being written between 48-96 AD. so if they “discerned and testified which ones were God-breathed” why do you reject their Bible? You are not very consistent! I am talking about the 27 New Testament books – Origen’s list (I mentioned that in a previous post in another one of your articles here) around 250 AD is the same as Athanasius’ list in 367 AD as to the canon. Athanasius did not approve of most of the Apocrypha Jewish books written between 300-100 BC – his list does include Baruch and the letter of Jeremiah as part of Jeremiah as “one book”; but he did not approve of Maccabees and the others that the RC claims is infallible), and neither did Jerome. Jerome was one of the few who actually investigated the Jewish canon by going to Israel and living among the Jews there and learning Hebrew. His investigations confirm the list of the OT canon that was meant in Luke 24:44; Luke 11:51 (“from the blood of Abel” = Genesis, “to the blood of Zechariah” = the Zechariah killed in 2 Chronicles 24 – the last book written in the OT and Jews to this day still have that one as the last book in their canon, written around 430 BC); and Romans 3:2. (“the Jews are entrusted with the oracles of God”). Josephus in Against Apion 1:8 also confirms the correct OT canon as the same as the Protestant OT canon. So we have Jesus, Josephus, the Jews, and Jerome on our side of that argument. There is no such thing as a “Papal office” in Scripture, nor in early church history – the concept started gaining traction only after the split between the Eastern Orthodox Church vs. The Roman Catholic Church (1054 AD) and it grew from there. It is completely absent from the first 600 years of early church history. So, there is no such thing as a “Protestant Pope” either. The concept is a false concept. I saw a similar post on Sola Scriptura on an atheist/skeptic site once. Unsurprisingly, a few RCs joined in with a few comments. Maybe Paul William should be fair to us and produce a pro-Sedevacantist post so that he could give Evangelicals, Muslims and Sedevacantists a chance to comment about the Post-Vatican II RCC. "So where do evangelicals get such a high view of scripture? From the Reformers? Sure. From the Church Fathers? You bet. But ultimately we get it from the scriptures themselves." Ken, did I see recently that you were engaging Art Sippo in a Facebook comment box? He came in and started making comments; and I have been responding to him. Somehow I have searching on Twitter, for my friend Rod Bennett, and Rod's comment came up on D. A. s facebook, and I felt I had to respond to my friend. Rod Bennett (we were in the same Baptist Church and friends and he was one of my groomsmen at our wedding in 1988) converted to Roman Catholicism in 1996 and later wrote a book entitled "Four Witnesses" and we debated for 8 years and he told me in 2004 he didn't want to debate anymore. (sometime around 2000 ? or so, he said, "go debate with D. A. - he likes to debate". Basically, Rod's challenges were the reasons I started studying the early church fathers and church history and that is what led me to find you and James White on the issues. I hope to someday publish a formal response to Rod's book, "Four Witnesses" - I have some things already written out, but have not published it yet. somehow I was searching for my friend Rod Bennett and D. A.s face book came up, cause Rod made a comment on the 5 points of Calvinism there - it was a massive mis-understanding and mis-representation, and so I responded to him, but he didn't make any more comments; then Sippo came into the discussion. Rod made the same type of arguments that Scott Hahn and Mattatics were making at the time, and that is what motivated me to find Dr. White's material, and then I found your material. You guys, along with Svendsen and William Webster's material and David King, and now Michael Kruger on the canon and John Bugay's writtings have been a great help. Some sort of summary post would be interesting. Dr. Sippo usually is very quotable. D.A. was good in that he made Sippo behave and cut out his ad hominem and bombast. And then you have the article on Walid Shoebat's site, "Exposing Martin Luther’s Love Affair With Islam"
Maybe worth a post or two by you. Shoebat has lost credibility with his 666 bismillah and end-times madness stuff. I didn't read every word; but certainly James Swan could really set him straight with context of Luther's writings, just as he as very skillfully done with Roman Catholic apologists. Indeed, that is why i suggested it. Although mine was personal as to Sippo's past behavior that Dr. White mentioned, in my opinion, it was not technically bombast or nor an ad hominem argument, but it was about his previous documented behavior at the debate he had with Dr. White. D. A. deleted the whole thread on his Facebook page earlier today; he didn't say why; I guess he got tired of both Art and I going back and forth with each other in argumentation. I had saved some of it; but I didn't get the last stuff. I realize I'm coming to this conversation a bit late, but I thought I might make mention of Martin Chemnitz' Examination of the Council of Trent. In his examination of how the Council of Trent handled the Canon of Holy Scripture, he points out that they (the Romanists) use the same methodology as the Jews who were trying to refute the Christian canon (the inclusion of the NT books). It's ironic.